IT'S A GAME CHANGER - Understanding and recognizing simple patterns in people, how you and others increase energy, process information, make decisions, and organize daily tasks, is advantageous in every aspect of your life and career. IT'S CONVENIENT - Sessions are conducted in person at an agreed upon location or online. Time slots are available during the day, in the evening, or on weekends. IT'S LONG-LASTING - The Myers-Briggs® Personality Type tool provides a wealth of resources and information to help you continue to learn about yourself and others as you advance through your life and career. IT'S COST EFFECTIVE - Once your Myers-Briggs® Type is verified, you automatically recieve a 40% discount on all other reports which can be sent via email. Group discounts are also available. Read through the different assessment types below and then sign up to get started on your questionnaire and get your one-on-one or group session scheduled ASAP. Please note prices do not include GST. 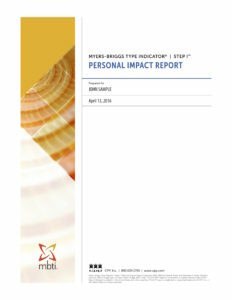 Enhance your IMPACT in all aspects of your life with this long-lasting and comprehensive report that uses your Myers-Briggs® Type to reveal your individual strengths and challenges to facilitate your personal advancement goals. 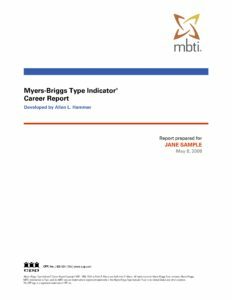 Improve your job satisfaction and performance by exploring your preferred tasks, work environments, and the most and least popular occupations for your Myers-Briggs® Type. 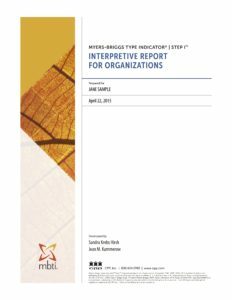 Heighten your performance at work by examining your strengths and areas of improvement to develop your professional advancement strategy based on your Myers-Briggs® Type’s natural work style, communication style, and preferred approach to problem solving. Conquer the ability to manage stress by discovering your natural and stressed personality characteristics , how your “stressed personality” is triggered, and tips on handling your stress reactions based on your Myers-Briggs® Type. 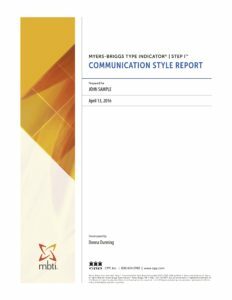 Expand your ability to communicate effectively, lead a team, and assist conflict management through learning about your preferred communication style, practical tips, and steps for improvement based on your Myers-Briggs® Type. Develop the ability to confidently lean into and mediate conflict situations through understanding your Conflict Style based on your Myers-Briggs® Type and how it relates to and tips on dealing with other conflict styles. 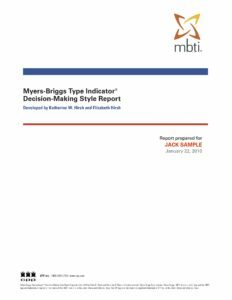 Explore your Decision-Making Style based on your MBTI® Type and develop your ability to approach difficult decision making confidently, manage more effectively, and improve your leadership skills.